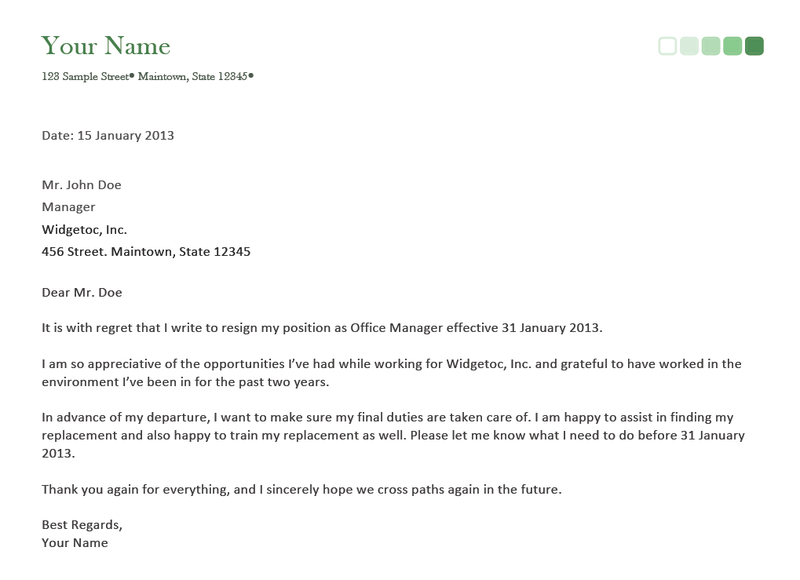 Part 1: Why Do You Need to Write a Resignation Letter on Short Notice? There may come a time in your life where you find yourself making a rather difficult decision. You might find that you want to resign from a job voluntarily. In a case like that it is imperative for you to at least give your employer a resignation letter on a short notice or a two weeks’ notice in which you need to state that you will be leaving the current job. There are several reasons and many possible circumstances as to why you might want to quit the job at the moment. Writing a resignation letter on short notice is important because it helps you maintain strong and positive relationships with the people you work with. You have to look out for yourself but you also have to make sure that you do not burn any bridges. It is an official statement which ensures that you will be leaving the job. You cannot leave a job without informing your employer, so the first thing that you have to do when quitting your job is to write a resignation letter to your boss. The resignation letter helps you follow a proper system and will help your employer understand why you are leaving. This will not make them feel betrayed or wronged; instead they might understand and be supportive of your decision. It all depends upon how you handle the situation. If you wish to preserve your present good relations with your employer and your colleagues then you must write a proper (yet short) resignation letter that can help explain your decision and prepare them for what they have to do next. Start your letter with a small and simple statement stating that you wish to resign. Do not beat around the bush, but include specifics such as the date you will be leaving and how long you will be working at the company before you leave. Be gracious and show some gratitude to your employers, the company that you worked for and such details. Also take care to mention the name of your mentor or supervisor who has been helpful to you when you worked at the company. Try to be supportive and show that even though you are giving your resignation letter you will gladly stick around until your employer finds a suitable replacement for you. It is with a heavy heart that I am informing you of my decision to resign from my position of Marketing Manager at the Nine Way Production Company. After careful deliberation I have reached the conclusion that my efforts are better suited to another corporation. This is why I have accepted a role at another company. You must know that this decision was particularly hard for me as I love my experience at your firm, which has made me capable and confident of pursuing my goals. According to my contract, I must serve 5 years at your firm; however, I would like you to consider this as my formal request that I be released from the 5 year contact due to the situation at hand. I do not want to cause you any trouble so if there is anything I can do to make this situation easy, I will. My best wishes are with the company and my colleagues who have helped me a lot along the way. I am grateful for the opportunities provided to me at your firm. It has been a pleasure working with you. Kindly consider this my letter of resignation from my position of Marketing Manager at the Seventh Heaven Production Company. Despite the fact that my employment contract states I need to work with you for 5 years, I would like to cut it down to 2 years; the number of years I have worked for your company. This would mean that I would complete my employment on the June 1st 2013. I really hope that we can reach an agreement allowing me to resign from my post and pursue my future career goals. I will do everything in my power to ensure that everything goes smoothly and that I complete the projects that have been assigned to me prior to the submission of my letter. I am utterly grateful to you, the company and to my colleagues for offering me all the wonderful opportunities that I have enjoyed at this firm. I hope we part on a positive note and that I can look forward to a positive reference from you in the future. Please note that I, Gerrard Martin, am writing this letter to bring to your notice the fact that I have accepted the position of Marketing Manager at Jay ford Production Company. Due to this, it is with great regret that I have to say that I will have to resign from my duties as PR Consultant at the G5 Production House. I will cease to be a part of the company two weeks from now. I understand that this is short notice but due to some reason I have not been able to send this letter in before. I have an association with your firm for the past 4 years and working here has made be capable and confident. I can say that it has been great working with you for the past 4 years. Server responsed at: 04/19/2019 11:21 a.m.